Indian-Australian connections are particularly noteworthy now with the Indian cricket team finally beating Australia in a Test series in Australia, and vastly more importantly, increasing Indian trade with Australia and substantial Indian immigration to Australia. 26 January is Indian Republic Day that commemorates replacement of colonial British rules by the adoption of the Indian Constitution on 26 January 1950, and a formal End to Britain’s 2-century Indian Holocaust and Indian Genocide. Conversely, 26 January is also Australia Day but commemorates the British invasion of Australia on 26 January 1788 and the Start of the ongoing Australian Aboriginal Genocide and Aboriginal Ethnocide. While Indian Independence Day (15 August) marks the anniversary of Indian Independence from the British on 15 August 1947, India’s Republic Day commemorates the adoption of the Constitution of an independent Indian republic on 26 January 1950. Thus according to Wikipedia: “Republic Day honours the date on which the Constitution of India came into effect on 26 January 1950 replacing the Government of India Act (1935) as the governing document of India. The Constitution was adopted by the Indian Constituent Assembly on 26 November 1949, and came into effect on 26 January 1950 with a democratic government system, completing the country’s transition towards becoming an independent republic. 26 January was chosen as the Republic day because it was on this day in 1930 when Declaration of Indian Independence (Purna Swaraj) was proclaimed by the Indian National Congress as opposed to the Dominion status offered by British Regime” . Thus Indian Republic Day marks the formal rules-based independence of India from the brutal and genocidally racist rule of its former colonial master, Britain. Whereas Australia Day marks the Start of over 2 centuries of Anglo-imposed Aboriginal Genocide and Aboriginal Ethnocide, Indian Republic Day marks the formal, constitutional End to over 2 centuries of genocidally racist British rule in India. Britain’s 2-century Indian Holocaust and Indian Genocide. Before British invasion in the mid-18th century, India was responsible for about a quarter of world GDP. However under the genocidally racist British, India’s share of the world economy declined from 24.4% in 1700 to 4.2% in 1950. India’s share of global industrial output declined from 25% in 1750 to 2% in 1900 . From available data on India’s GDP and India’s share of world GDP since 1700 [3, 4], one can crudely estimate that if India had remained free with 24% of world GDP as in 1700 then its cumulative GDP would have been $232 trillion greater (1700-2003) and $44 trillion greater (1700-1950) . Eminent Indian economist Professor Utsa Patnaik (Jawaharlal Nehru University) has estimated that Britain robbed India of $45 trillion between 1765 and 1938 [6-8]. Imposed poverty kills. Poverty-derived avoidable mortality (avoidable death, excess mortality, excess death, premature death, untimely death, deaths that should not have happened) can be estimated as the difference between the actual deaths in a country and the deaths expected for a peaceful, decently governed country with same demographics (birth rate and percentage of children) . Using Indian census data 1870-1950, assuming an Indian population of about 200 million in the period 1760-1870, and estimating by interpolation from available data an Indian avoidable death rate in (deaths per 1,000 of population) of 37 (1757-1920), 35 (1920-1930), 30 (1930-1940) and 24 (1940-1950), one can estimate Indian excess deaths of 592 million (1757-1837), 497 million (1837-1901) and 418 million (1901-1947), roughly 1.5 billion in total or 1.8 billion including the Native States [21, 22]. This atrocity is a holocaust (a huge number of people killed) and a genocide (acts committed with intent to destroy a group in whole or in part). Despite a very high birth rate, the Indian population did not increase between 1860 (292 million) and 1934 (292 million) . This is indicative of massive avoidable deaths from imposed deprivation that can be estimated as 745 million (1860-1934) or an average of about 10 million Indian avoidable deaths from deprivation per year . Shashi Tharoor in his book “Inglorious Empire. What the British did to India” states that “The British left a society with 16 per cent literacy, a life expectancy of 27, practically no domestic industry and over 90 per cent living below what today we would call the poverty line” (, page 215 ) . The life expectancy of 27 years thus corresponded to about 10 million Indian avoidable deaths from deprivation per year. Today after nearly 72 years after Indian Independence and 69 years after the End of British rules through the adoption of the Constitution of India, things have improved considerably in India. The life expectancy in India is now 69 years (27 years in 1947) and avoidable deaths as a percentage of population is now 0.4% (as compared to a genocidal 2.4% in 1940-1950) . India has a lot to celebrate on Indian Republic Day 2019. However despite immense progress since the End of genocidal British rule, India still has a long way to go. Thus in present day India (population 1.3 billion) about 4 million people die avoidably from deprivation each year as compared to zero (0) in China, a pluralist one-party state that has abolished endemic poverty . At this point it is useful to again consider the terms “holocaust” and “genocide” used here. “Holocausts” involve the deaths of huge numbers of people and indeed this term was first applied to a WW2 atrocity by N. G. Jog in 1944  in relation to the WW2 Bengali Holocaust in which 6-7 million Indians were deliberately starved to death by the British with Australian complicity [9, 11-22]. The term “Holocaust” has become synonymous with the WW2 Jewish Holocaust (5-6 million Jews killed through violence or imposed deprivation) that was part of a wider WW2 European Holocaust (30 million Slavs, Jews and Gypsies killed) . While denial of the WW2 Jewish Holocaust is criminalized in Apartheid Israel and some European countries, the WW2 Bengali Holocaust (WW2 Indian Holocaust, WW2 Bengal Famine), the wider WW2 European Holocaust, and the WW2 Chinese Holocaust (35 million Chinese killed under the Japanese, 1937-1945) [22, 26] are overwhelmingly ignored in the West. Holocaust ignoring and genocide ignoring are far, far worse than repugnant holocaust denial and genocide denial because the latter can at least invite public refutation and public debate. “Genocide” is defined by Article 2 of the UN Genocide Convention thus: “In the present Convention, genocide means any of the following acts committed with intent to destroy, in whole or in part, a national, ethnic, racial or religious group, as such: a) Killing members of the group; b) Causing serious bodily or mental harm to members of the group; c) Deliberately inflicting on the group conditions of life calculated to bring about its physical destruction in whole or in part; d) Imposing measures intended to prevent births within the group; e) Forcibly transferring children of the group to another group” . Clearly the passive mass murder of 1.8 billion Indians by the British is both an Indian Holocaust and an Indian Genocide. One notes that violent mass murder of Indians also occurred under the British. Thus Amaresh Misra has estimated that 10 million Indians may have been killed by the British in reprisals for 2,000 British deaths in the Indian Rebellion (Indian Mutiny) of 1857 [28, 29] . In relation to “intent to destroy”, in 1857 British popular writer Charles Dickens advocated the total extermination of the Indian people: “It is my intention, with all possible avoidance of unnecessary cruelty and with all merciful swiftness of execution, to exterminate the Race from the face of the earth, which disfigured the earth with the late abominable atrocities” [30, 31]. 2-century Anglo-imposed Australian Aboriginal Genocide and Aboriginal Ethnocide. While on 26 January all Indians celebrate the End of British-imposed genocide, on the same day most Australians are celebrating the arrival of the British “First Fleet” i.e. the British invasion of Australia on 26 January 1788 that was the Start of an ongoing Aboriginal Genocide and Aboriginal Ethnocide. Indigenous Australians object strongly to Australia’s National Day celebrations being held on the anniversary of the Start of the Aboriginal Genocide. Just imagine the outrage if Germany’s National Day were held on the anniversary of Kristallnacht (November 9 to November 10, 1938) when Nazi gangs in Germany burned synagogues, smashed windows in attacking Jewish homes, schools and businesses, and killed about 100 Jews . In the subsequent WW2 Jewish Holocaust 5-6 million Jews were killed through violence or imposed deprivation [22, 32]. In the Australian Aboriginal Genocide (1788 to the present) about 0.1 million Indigenous Australians were killed violently and about 2 million died from deprivation and introduced disease [33, 34]. The Indigenous population dropped from about 1 million to 0.1 million in the first century after the invasion in 1788, mainly through violence, dispossession, deprivation and introduced disease. The last massacres of Aborigines occurred in the late 1920s in Central Australia in the Coniston Massacre [33-46]. Throughout much of the 20th century there was a policy of forcibly removing Aboriginal children (especially mixed race children) from their mothers, a systematic genocidal policy involving the removal of perhaps 0.1 million children (the Stolen Generations). This practice ended in the 1970s, and in 2008 Labor Prime Minister Kevin Rudd offered a formal apology, but removal of Aboriginal children from their mothers continues (albeit for ostensibly different reasons) at a record rate [47-49], leading Kevin Rudd to warn of a “second stolen generation”) . Before the British invasion in 1788 there were 350-750 different Indigenous Australian (Aboriginal and Torres Strait Islander) tribes and a similar number of languages and dialects, of which only 150 survive today and of these all but about 20 are endangered in a process of continuing Australian Aboriginal Ethnocide and Cultural Genocide of remaining Indigenous Australian societies . Removal of Aboriginal children from their mothers and communities, removal of Federal and State government support for remote Aboriginal communities, and substantial removal of instruction of Aboriginal children in their own language are all ultra-conservative measures that threaten destruction of most of the surviving Aboriginal languages and dialects. According to a recent study (2009): “At the end of 2008 the Northern Territory Government, supported by the Commonwealth Government, all but closed bilingual education in remote Indigenous schools by determining that the language of instruction for the first four hours of school must be English. This decision could spell the death of the remaining endangered Indigenous languages in Australia” . Indigenous Australian avoidable deaths from deprivation as a percentage of Indigenous population on a global comparative scale was recently estimated at 0.6% , noting that Indigenous Australia has a much higher proportion of children than non-Indigenous Australia . With an Indigenous population of about 800,000, this means that about 5,000 Indigenous Australians die from deprivation each year. . An alternative recent assessment of avoidable Indigenous Australian death rate comes from “Closing the Gap. Prime Minister’s Report 2018” (Figure 28, page 105 ) – the Indigenous death rate is 1,000 per 100,000 of population pa whereas the non-Indigenous death rate is 540 per 100,000 pa, with the difference, 460 per 100,000 pa being the Indigenous avoidable death rate. On this basis the Indigenous avoidable death rate is 0.46% pa or about 0.5% per year. By way of comparison, the avoidable death rate from deprivation as a percentage of population in impoverished India is 0.4% pa and 1.0% pa in deeply impoverished non-Arab Africa . The life expectancy for Indigenous Australians is about 10 years less than for non-Indigenous Australians. Indigenous Australians were excluded from citizenship and subject to gross human rights violation until a Referendum in 1967 (that allowed the Federal Government to make laws about Indigenous Australians and allowed them to be counted whereas formerly they were counted under a Fauna and Flora Act), the 1975 Racial Discrimination Act (that was subsequently flouted by the 2008 military invasion of Northern Territory Indigenous communities ) and the 1992 Mabo Decision of the High Court that overturned the notion of “terra nullius” (Australia as an empty land to be colonized), recognized native title for the first time, and ultimately resulted in qualified land rights, mainly in arid and remote areas. Effective slavery of surviving Indigenous people on huge rural estates on stolen land involved “wages” of sugar, tea and tobacco and exposure to the core White Australian alcohol abuse culture with present day consequences of a type 2 diabetes epidemic (with attendant obesity, cardiovascular, kidney and eye problems), alcohol-fuelled domestic violence, and huge preventable deaths and morbidity associated with smoking and drinking . There are appalling differences between Indigenous and non-Indigenous Health. Thus Australia is the only advanced country with trachoma (an eye disease that is endemic in remote communities). Macular degeneration in the eyes is rare among Indigenous Australians because they mostly do not live long enough to acquire it [51, 52]. Compared to non-Indigenous Australians , Indigenous Australians suffer from overcrowded and substandard housing, have much higher unemployment, and have a disproportionately 10-fold higher representation in prisons. Poverty kills and the estimated per capita income for Indigenous Australians is US $22,000 as compared to US$54,000 for Australia as a whole (0.8 million Indigenous Australians represent about 3% of the Australian population of 25 million) . About 5,000 Indigenous Australians die avoidably from deprivation each year in a continuing Aboriginal Genocide. There is furious debate in Australia about celebrating Australia Day on the Start date for the continuing Aboriginal Genocide and Aboriginal Ethnocide. Indigenous Australians and a large body of decent Green, Socialist and Labor Left sympathizers object to the present highly offensive celebration on 26 January and cry “Change the date!”. 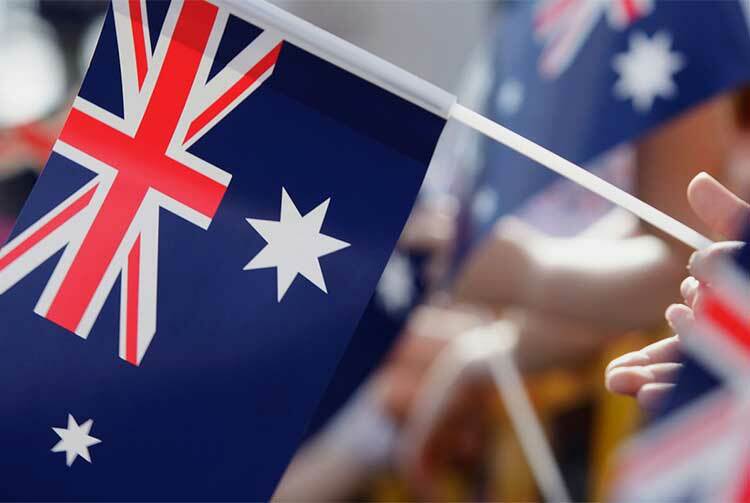 Australian citizenship ceremonies have been held on Australia Day for 2 decades by local government, but several decent local government councils around Australia have consulted with their Indigenous inhabitants and resolved to hold these ceremonies on a non-offending day. However the extreme right wing and jingoistic Liberal Party-National Party Coalition Government led by populist PM Scott “Scomo” Morrison has responded by removing the right to hold such ceremonies from the decent councils. The Greens have responded by offering to hold such ceremonies on behalf of such “banned” councils on the basis of advice from the Parliamentary Library that MPs and senators can do this under present regulations . However Rightwing Labor Opposition leader Bill Shorten (and extremely likely new Australian PM after the May 2019 Federal election) favours retention of Australia Day on 26 January, while rejecting the Coalition Government’s ban on informal dress for such ceremonies: “It will remain on the 26th of January. Having a national day is a good idea… People want to be left alone on Australia Day. I don’t want to be the fashion police telling people what they can wear at citizenship ceremonies” . Meanwhile the Indigenous Australians will continue to hold Invasion Day rallies around Australia on 26 January in the face of intransigent, ignorant, offensive, look-the-other-way, and just plain stupid Mainstream Australian insensitivity to the horrible reality of over 2 centuries of Anglo Aboriginal Genocide and Aboriginal Ethnocide regardless of how offensive, racist and absurd this intransigence appears to decent folk around the world. While on 26 January India celebrates Republic Day and the formal End of British-imposed genocide, look-the-other-way White Australia offensively and shamelessly continues to celebrate Australia Day on the anniversary of the Start of the ongoing Australian Aboriginal Genocide and Aboriginal Ethnocide that represents the worst ever genocidal atrocity in human history from a qualitative perspective. . Poor fellow my country.
. “Republic Day (India)”, Wikipedia: https://en.wikipedia.org/wiki/Republic_Day_(India) .
. Grace Moore (2004), “Dickens and the Empire. Discourses of class, race, and colonialism in the works of Charles Dickens” , Ashgate Publishing, Aldershot , UK ): http://www.amazon.com/Dickens-Empire-Discourses-Colonialism-Nineteenth/dp/glanceands=books/0754634124 .
. Kristallnacht”, Wikipedia: https://en.wikipedia.org/wiki/Kristallnacht .
. “Aboriginal Genocide”: https://sites.google.com/site/aboriginalgenocide/home .
. Colin Tatz, “With Intent to Destroy. Reflecting on Genocide”, Verso, London, 2003, pages 67-68.
. Colin Tatz, “With Intent to Destroy. Reflecting on Genocide”, Verso, London, 2003, pages 74-94.
. Colin Tatz, “With Intent to Destroy. Reflecting on Genocide”, Verso, London, 2003, pages 122 -123.
. Colin Tatz, “Genocide in Australia”, AIATSIS Discussion Paper, Number 8, 1999: http://www.aiatsis.gov.au/research/docs/dp/DP08.pdf .
. Gary Foley, “Australia and the Holocaust: A Koori perspective”, The Koori History website, 1997: http://www.kooriweb.org/foley/essays/essay_8.html .
. Chalk, F. and Jonassohn, K. (1990), “The History and Sociology of Genocide. Analyses and Case Studies” (Yale University Press, New Haven & London), “The Tasmanians”, pp204-222.
. Gideon Polya, “Ongoing Aboriginal Genocide In Apartheid Australia”, Countercurrents, 3 April, 2010: https://www.countercurrents.org/polya030410.htm .
. Gideon Polya, “Film Review: “Utopia” By John Pilger Exposes Genocidal Maltreatment Of Indigenous Australians By Apartheid Australia”, Countercurrents, 14 March, 2014: https://countercurrents.org/polya140314.htm .
. “Coniston massacre”, Wikipedia: https://en.wikipedia.org/wiki/Coniston_massacre .
. “Australian frontier wars”, Wikipedia: https://en.wikipedia.org/wiki/Australian_frontier_wars .
. Paddy Gibson, “Stolen futures”, Overland , Spring 2013: http://overland.org.au/previous-issues/issue-212/feature-paddy-gibson/ .
. Katharine Murphy, “Indigenous child removal rate risks “second stolen generation”, Kevin Rudd warns”, Guardian, 13 February 2017: https://www.theguardian.com/australia-news/2017/feb/13/indigenous-child-removal-rate-risks-second-stolen-generation-kevin-rudd-warns .
. Jo Caffery, Patrick McConvell, and Jane Simpson, “Gaps in Australia’s Indigenous language policy”, AIATSIS, December 2009: https://aiatsis.gov.au/publications/products/gaps-australias-indigenous-language-policy-dismantling-bilingual-education-northern-territory .
. “Closing the Gap. Prime Minister’s Report 2018”: https://closingthegap.pmc.gov.au/sites/default/files/ctg-report-2018.pdf?a=1 .
. “Selected health conditions”, Australian Indigenous Health InfoNet: http://www.healthinfonet.ecu.edu.au/health-facts/overviews/selected-health-conditions .
. “Introduction”, Australian Indigenous Health InfoNet: http://www.healthinfonet.ecu.edu.au/health-facts/overviews/introduction .
. Paul Karp, “Greens “won’t let” Morrison force councils to hold Australia Day citizenship ceremonies”, Guardian, 16 January 2019: https://www.theguardian.com/australia-news/2019/jan/16/greens-wont-let-morrison-force-councils-to-hold-australia-day-citizenship-ceremonies .
. Max Koslowski, “”It will remain on the 26th”: Bill Shorten rules out changing Australia Day date”, Sydeny Morning Herals, 16 January 2019: https://www.smh.com.au/politics/federal/it-will-remain-on-the-26th-bill-shorten-rules-out-changing-australia-day-date-20190116-p50rm8.html . Zionist-subverted , US lackey and covertly racist Australia is second only to America as a supporter of genocidal Apartheid Israel , and the National Days of all 3 colonizer states are anniversaries of the Start of the genocide of their Indigenous People. Thanks for your terrific articles Dr Polya. One specific error is the myth that aboriginals ‘were counted under the Flora and Fauna act’ prior to the 1967 referendum. This is a myth that has been perpetuated for many years.